Be Careful - Avoid Junk Health Insurance! Many Americans have been fooled into believing they are purchasing affordable health insurance only to find out after they have gotten sick that they actually purchased a junk health insurance plan. Here are some warning signs to be mindful of when shopping for comprehensive health insurance. There are no free rides when it comes to the cost of health insurance. If you find a health insurance policy with low premiums that supposedly provides generous benefits then this is a red flag. Insurance companies need to collect enough premiums to cover the policyholder's medical needs. There are legitimate ways to lower your health insurance costs such as purchasing a policy with a high medical deductible. We recommend reviewing our affordable health insurance plans to find a true low cost policy with comprehensive medical benefits. A policy with "Guaranteed Acceptance"
With the healthcare reform law real health insurance companies do not have to offer coverage to an individual with preexisting health conditions until January of 2014. Marketers of junk health plans do not have to concern themselves with the high cost of preexisting health conditions because their policies are designed in a way to limit the maximum payout to a few thousand dollars. The only valid Georgia health plan sold in the market today is the pre-existing health condition plan offered through healthcare.gov. 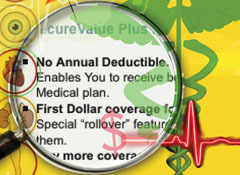 Junk marketers know that consumers do not like medical deductibles, so they design plans with a lot of sizzle - including no deductibles or first dollar benefits. A legit health plan without a medical deductible would be extremely expensive so a true policy includes a deductible to keep the premiums affordable. Be wary of a policy that specifically states the actual dollar amount to be paid for certain healthcare services. If a policy offers to pay up to $100 for 5 office visits per year, or $1,000 a day up to 30 days for hospital services then it is likely a junk policy. Individuals who purchase a junk plan often find themselves with thousands of dollars of medical bills that exceeded these limits of coverage. A comprehensive health insurance policy will define your maximum out of pocket expense (the combined total of your deductible and coinsurance) before the insurance company will pay 100% of the remaining medical expenses. Knowing what your maximum exposure limit is makes it easy to compare benefits from one plan to another. A company that promises large discounts on medical services is not offering actual health insurance. Individuals who purchase these discount cards often have trouble finding healthcare providers willing to offer the promised discounts. These products are not illegal, but they do not provide the financial security of a comprehensive health insurance policy.